SRINAGAR, India, November 18, 2015 (ENS) – India’s first electric car expedition was flagged off Monday, headed south from this northern Indian city to cover more than 5,000km (3,000 miles) across 52 locations over the next month. Three expedition-ready, all-electric, zero emission Mahindra e2os are being driven from Srinagar to Kanyakumari in the southern state of Tamil Nadu, covering the entire length of the country. Nicknamed the “Goodness Drive,” this journey is a project of automaker Mahindra Reva to encourage more of India’s drivers to opt for electric mobility. 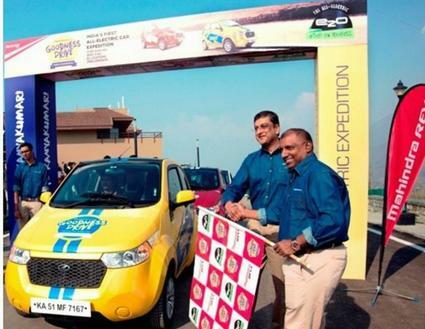 The drive was flagged off by Mahindra Reva CEO Arvind Mathew in the presence of Aravinda De Silva, the former renowned cricketer from Sri Lanka. A part of the US$16.9 billion Mahindra Group, Mahindra Reva Electric Vehicles has long been committed to sustainability. The Mahindra Reva manufacturing plant is India’s only Platinum certified automotive facility, certified by the Indian Green Building Council (IGBC). “Every car that leaves the facility is solar charged, and nearly half the energy consumed in the production process is pure, green energy,” Mahindra explains. The battery electric e2o (say ee-two-oh) was launched in India in March 2013 at a price between 6.5 lakh (US$11,900) to 8.5 lakh (US$15,670) depending on the city and before any subsidy. The car has a lithium-ion battery pack that takes five hours for a full charge. Weighing 830 kg (1,830 lb), the e2o has a range of 120 km (75 mi) and a top speed of 90 km/h (56 mph). The e2o is one of the more technically advanced cars on Indian roads, with smartphone-controlled features, a GPS navigation system and a dashboard-mounted touchscreen, keyless entry, a start/stop button, and regenerative braking. The regenerative braking technology feeds energy back into the car’s batteries and charges them every time the brake is applied or the accelerator is not pressed. According to the company, the e2o’s safety features comply with European norms.